Directed by Russ Barry and produced by Bonnie Silva, An Act of Dog tells the story of an artist who sets out to paint 5,500 portraits, only to discover that the paintings are taking their toll on him in ways he never imagined. The half hour documentary premiered on PBS network KET with Craig Cornwell as Executive Producer, and was distributed to PBS stations nationwide through NETA. 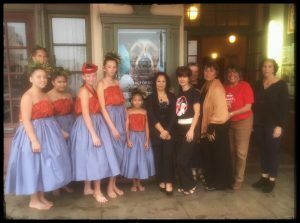 A US INPUT 2018 national pre-selection, the film had its Hawaii premiere at the Palace Theater in Hilo. Fundraising efforts for the documentary’s audience engagement campaign continue. When fully funded, the campaign will include a dedicated web site for the film where viewers inspired by An Act of Dog can watch additional video clips, learn how to host community-based screenings, find out more about Mark and Marina’s journey, and explore ways to get actively involved with the issue artist Mark Barone is depicting. An Act of Dog can be seen on the World channel beginning April 30, 2018.